With only 24 hours in Petra, it is best to begin the trip with an overnight stay in the nearby town of Wadi Musa which has plenty of dining and accommodation options. While many visitors spend a few days exploring this UNESCO World Heritage site, it is still possible to visit Petra in 24 hours. 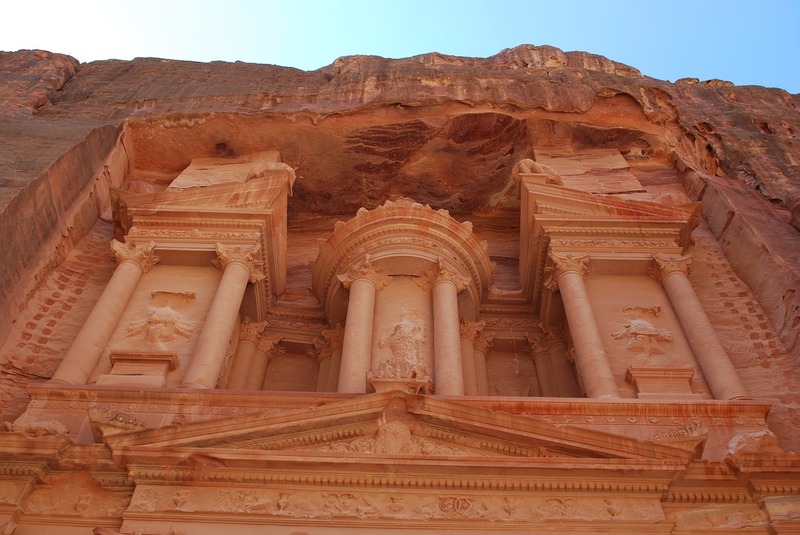 Petra is often deemed one of the most beautiful archaeological sites in the world and it is easy to see why. 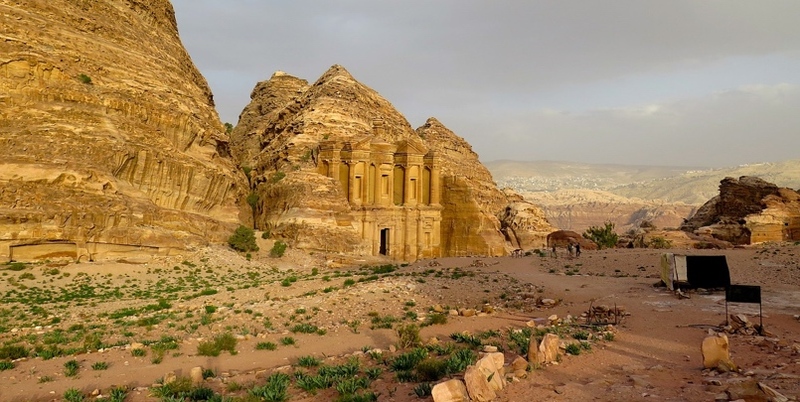 It is an ancient Nabatean city that is located in the Jordanian desert. Each monastery and temple in Petra is carved from sandstone into the cliff faces making it a highly photogenic landmark. Although Petra is very large, archaeologists believe that 85% of the city is yet to be discovered. Petra can be explored either on foot, on horseback or even on a camel. 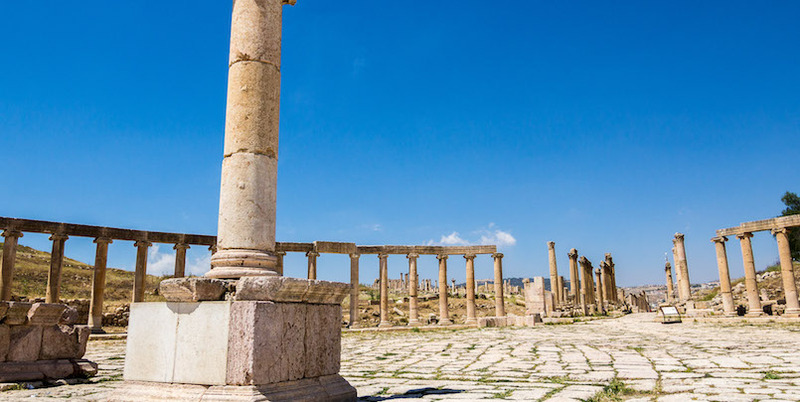 The entrance is located just under three hours by car from the capital city of Amman and it is well connected by buses and organized tour groups from all the major cities. 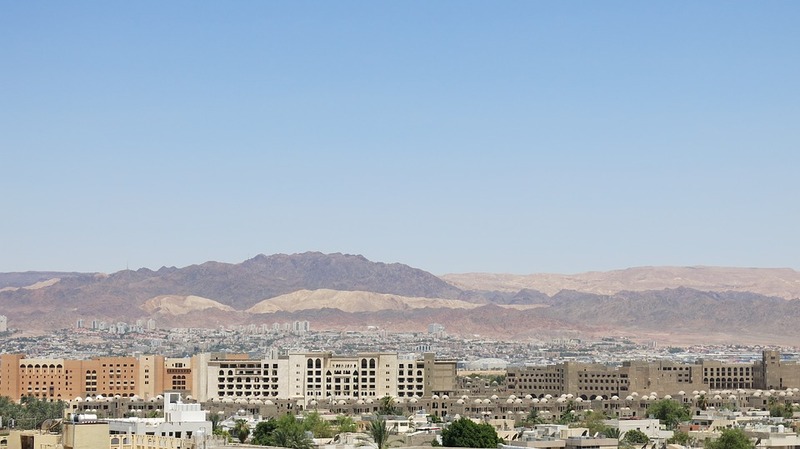 You can find an extensive list of tours to Petra from Amman, Aqaba and other places in Jordan here. If you have the energy, wake up really early and head to Petra when it opens at 6 am to catch a glimpse of the sunrise above The Treasury. Many visitors argue that this is the best time to see Petra in all its glory. There are also far fewer visitors at this time so you may be able to enjoy the site all by yourself for a few minutes. The entrance and very first landmark in Petra is Al Siq Canyon. It is a narrow canyon that is 1.2 kilometers long with 80 meter high cliffs. When walking through the canyon visitors will notice the man-made terracotta pipes and stone panels which were used to transport and filter the water from Wadi Musa into Petra. The original dams that were used to prevent flooding from the pipes are still in place at the beginning of the canyon. Al Siq Canyon is also adorned with a number of religious sculptures and visitors will also pass a tomb and a single standing fig tree. The canyon then continues to wind beneath the cliffs until it reaches the opening at The Treasury. The Treasury is an impressive monument that is carved into the sandstone cliffs. 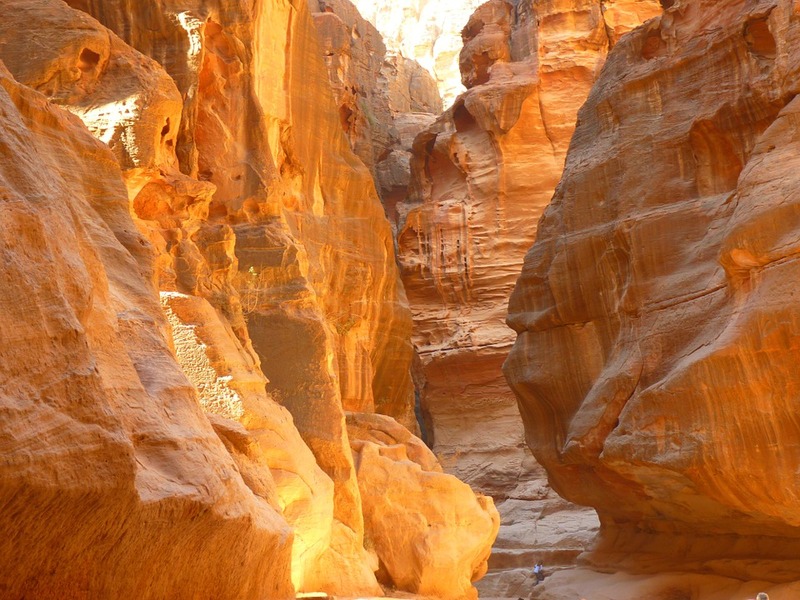 It is the first site that visitors will see upon reaching the opening of Al Siq Canyon. Originally intended as a tomb for King Aretas III, it oozes with grandeur and is possibly one of the most recognizable landmarks in Petra. The next site along is the Street of Facades which is a long row of tombs and houses that date back to around 2000 years ago. Visitors will want to spend some time here exploring this ancient street. From the Street of Facades are a number of hiking routes. In Petra, visitors should expect to walk a lot. An alternative is to opt for a camel or donkey ride which is particularly useful for those who are only spending 24 hours in Petra. There are also guides available at the entrance who will take visitors to the most significant sites and provide lots of interesting facts along the way. Close to the Street of Facades is the High Place of Sacrifice. In keeping with its name, the High Place of Sacrifice is 170 meters high, making it one of the tallest locations in Petra. There are clear signs to the route and visitors should be prepared to climb a lot of steps. 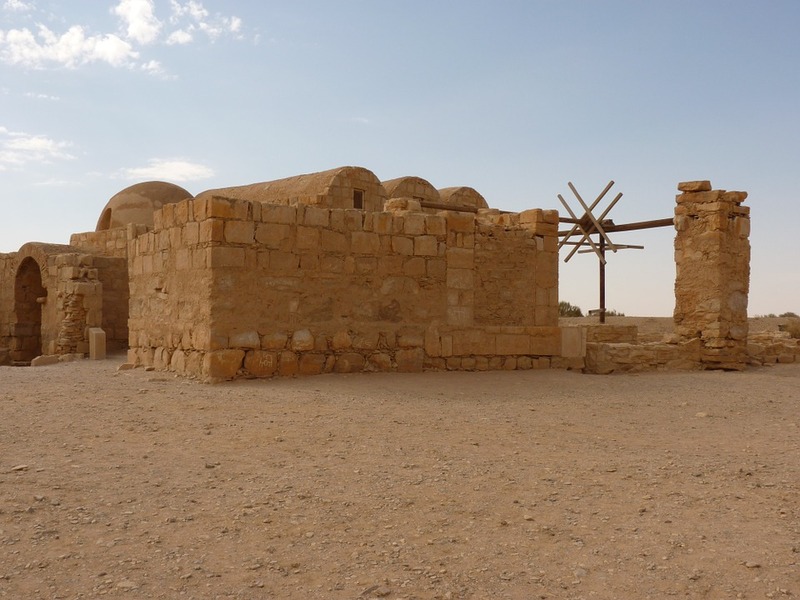 It is perched on top of the Jebel Madbah Mountain and was mainly used for the sacrifice of animals to the Nabatean God Dushara. Although it is a strenuous walk to the top, visitors will be rewarded with dazzling views of Petra. As well as the High Place of Sacrifice itself, there are a number of other things to see on the way down. 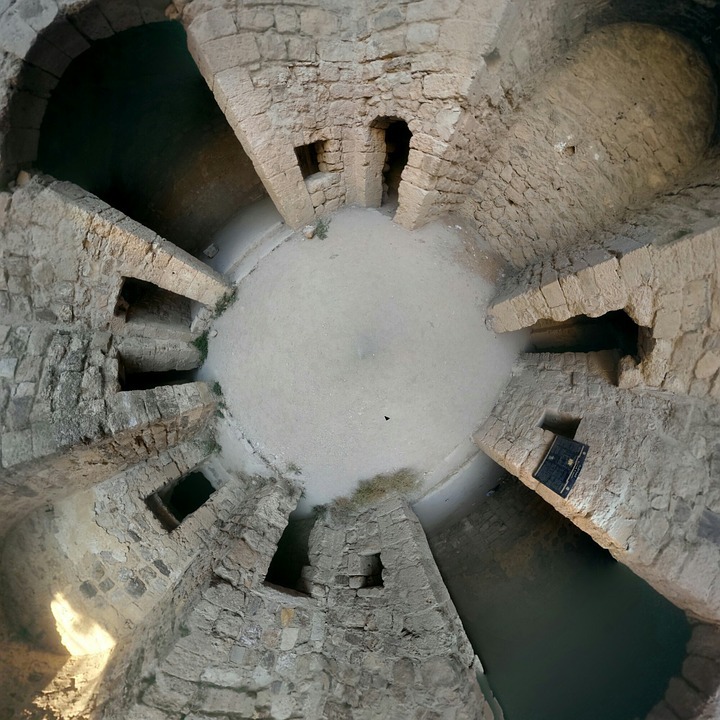 When taking the Wadi Farasa route down from the ridge, visitors will notice the ruins of the original Crusader walls. Halfway down this route is a Lion Monument that is sculpted into the wall and is believed to have been used as a water fountain for passers-by. The winding staircase will then lead visitors into the Garden Triclinium which was used for feasts to honor those who were buried in the Roman Soldier Tomb. The path then leads to other important sites including the Renaissance Tomb, Zantur Hill, and Amud Faraoun, before joining back with the main paths. It’s safe to say that by now you are hungry. There are many snack stalls on most routes which offer sweet and savory delicacies but it is also advisable to bring a packed lunch. After you have refueled, make some time to visit The Monastery. The climb to the Monastery is a steep one – over 800 steps in 20 minutes to be precise, but don’t let it put you off. Again, there are donkey rides that can take visitors straight up to the top (prices vary). On the route, visitors will come across lots of souvenir stands selling homemade scarves and jewelry. The Monastery is a striking façade that is larger than The Treasury. The afternoon is a more pleasant time to climb up to the Monastery as most of the route is in the shade by this time. On the way up is the Basin restaurant which offers idyllic views of the Monastery and is a perfect place for a late lunch. The restaurant provides a buffet meal of pasta and meat dishes – ideal for carb loading during a day of hiking through Petra. Depending on the time of year, it may be possible to watch the sunset below the Treasury, again with fewer crowds. Petra usually closes around 6 pm so make sure that you are back at the Treasury by this time. Sunset at Petra is very romantic and a wonderful opportunity for photos. After spending almost the entire day in Petra, head back to Wadi Musa where you can unwind. 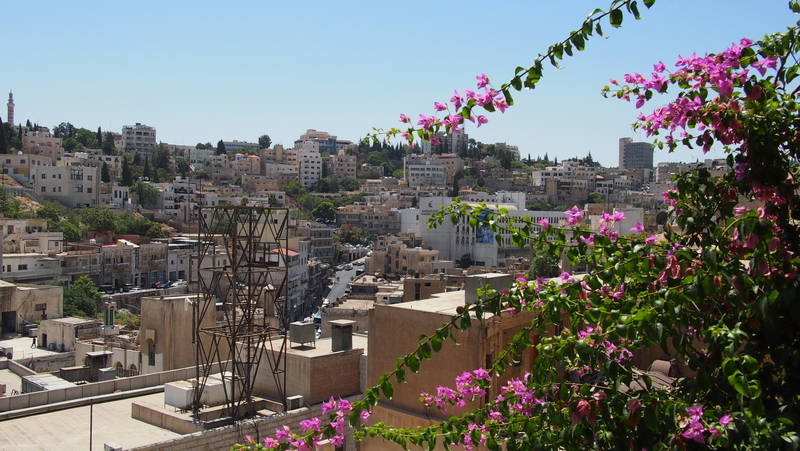 Tuck into a traditional Jordanian meal at one of the towns many restaurants. If you still have some time, finish your 24 hours in Petra with a relaxing session at a Turkish Bath. Prices: A one day ticket to Petra costs 90JD (126.85USD). If you are staying overnight in a nearby hotel, the cost of entry is only 50JD (70.47USD) or 55JD (77.52USD) for two days.